Our Summer Camp program is fun filled, academic and Christ centered! For over 30 years NHCS has been providing an affordable, safe, summer adventure for children and families in our community. Our Summer Camp program is offered each year from June to August for children 5 years old through 12 years old. Each week we plan two special events here at the school, one on Monday and one on Friday. 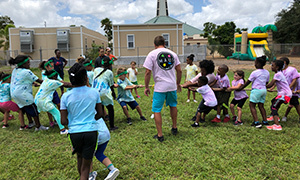 Monday events alternate and consist of activities such as obstacle courses, bounce houses, petting zoos, rock climbing walls, dunk tanks, the Everglades Encounter, Birds of Paradise from Jungle Island, plaster crafts, t-shirt tie-dye, and BBQ's just to name a few. Every Friday we have a water slide/water day that the kids absolutely love! If you are looking for an exciting summer adventure for your children, you have come to the right place.